Given the recent Colombo Stock Exchange (CSC) announcement that Real estate investment trusts (REITs) will be introduced to Sri Lanka, MTI’s Corporate Finance practice (with regional partners who have REIT expertise) have opined that “Sri Lanka is primed for REITs – given the rapid growth in its infrastructure, housing and retail domains”. 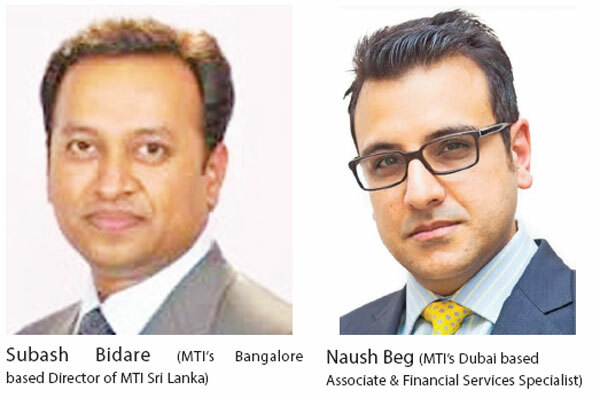 These views were expressed by MTI’s Dubai based Associate and Financial Services Specialist, Naush Beg and MTI’s Bangalore based Director of MTI Sri Lanka, Subash Bidare. REITs, are investment vehicles for real estate that are comparable to mutual funds or unit trusts. They allow both small and large investors to acquire and have an undivided interest in properties owned by REITs, in portion to their invested amounts. REITs are excellent structures to channel investments into the real-estate sector and their popularity to rise funding by property owners is well established, globally. The general benefits and structure of REITs have extensively been covered in a previous article, hence the objective of this article is to highlight the pivotal importance and reason for property owners to be involved in the REIT framework and the value-proposition that it presents to them. 1. Property owners can unleash the power of their land-bank through REITs. REIT structures give property owners (individuals or corporates) an alternative mechanism to raise quality capital by unlocking their lands banks and utilizing the unlocked cash towards core business activities. 2. Accordingly, REITs can also provide long term sustainable funding for developers by giving them a structure through which they can utilize their real estate assets and fund projects. 3. REIT structuring is a securitization process - that is, it takes the otherwise illiquid property or group of properties and transforms them into financial securities. These securities are negotiable given an active secondary market and further, like shares of a company they can conveniently act as a collateral for securing loans. 4. In addition to the above, REITS can also facilitate in creating liquidity to the extent needed, especially for short-term borrowing and without losing beneficial ownership of the property or encumbering the entire asset. 5 REITs can also be an effective way for property owners to create cash and diversify their investments and not have all their eggs in one basket. 6 Listed REITs have a secondary market and hence a market driven mechanism for price discovery through the interactions of buyers and sellers. These buyers and sellers can be investors world over and are not limited to the Sri Lankan market. 7 REITs also make a substantial part of an international investors portfolio. These investors include the likes of pension funds that also have the capacity to commit sizeable investments. 8 REITS can also be an effective way for estate planning for inheritance, allowing all successors the freedom to deal with their share as best suits them and without having to sell off the entire property. Given the above benefits, one is reasonably certain there will be keen interest on the side of the property owners to launch REITs. Hence their involvement in making REITs successful is also pivotal, as emphasized below. The main objective of a capital market is to serve as a medium for corporate to raise capital. Subsequently for a capital market to make economic sense and sustain it is essential it has quality corporate wanting to list. That is, to have a good supply side or deal flows of listed or listable entities. The importance of this is well visible and is one of the major issues faced currently in reference to the lackluster of the Colombo Stock Exchange. Analogous to the same is the requirement for property owners seeking capital via REITS and in turn providing quality assets for REIT structures. Hence their input in being part of the policy process and making REITs a success cannot be stressed less. Needless to say that the regulator, capital market intermediaries and investment banks amongst other are all important stake holders in this equation but the catalyst from a commercial point of view will always be the property owner.